The Blue Serpent Clock Egg is made of varicolored gold, diamonds and translucent royal blue and opalescent white enamel. 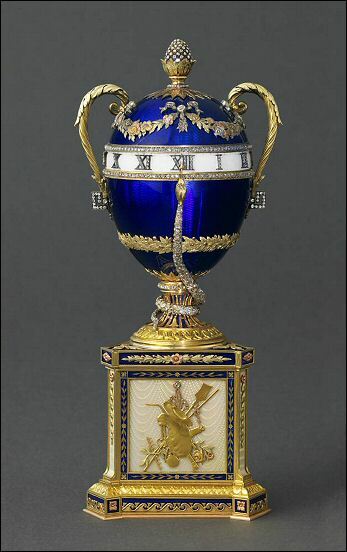 Designed as a clock in the Sèvres tradition, this Egg is a beautiful example of Fabergé's use of the quatre couleur technique in gold. Around the shaft supporting the Egg, a diamond-set serpent is coiled, the head and tongue pointing to the hour. In 1927 bought by Michel Norman of the Paris-based Australian Pearl Company, probably from a Russian official of the Antikvariat. In 1950 bought by Wartski, London. In 1972 sold to shipping magnate Stavros Niarchos. The Egg entered the Princely Collection of Monaco in 1974, as a gift to Prince Rainier III in honor of his Silver Jubilee — the 25th anniversary of his accession to the Grimaldi throne. The Blue Serpent Egg quickly became one of Princess Grace’s most treasured possessions, according to his Serene Highness Prince Albert II, son of Prince Rainier and Princess Grace. She adored it and kept it on the desk in her private study. After her tragic death in 1982, Prince Rainier sealed her suite, preserving the room as a memorial and thereby keeping the Blue Serpent Egg from public view. April 2005 Inherited by Prince Albert II, son of Prince Rainier III. In October 2008 this Egg, for the first time ever, will be presented to the public in a museum exhibition. See exhibitions! 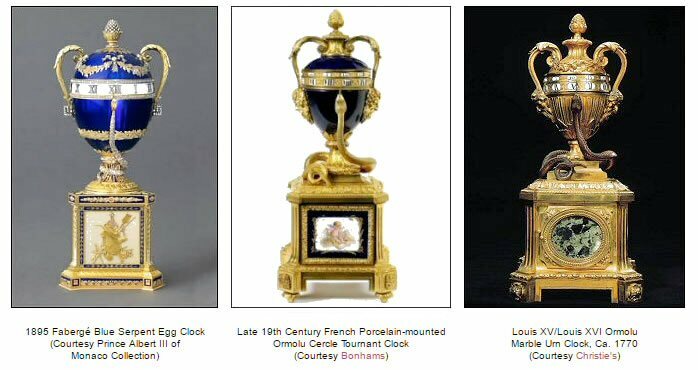 The Blue Serpent Clock Egg was long thought to be the 1887 Egg. New research (November 2008) however, proves that this egg belongs to the Fabrgé invoice for the year 1895. Read all about this research on the Fabergé Research Site, Recent Discoveries, THE FABERGÉ IMPERIAL EASTER EGGS: New Discoveries Revise Timeline or here on this website. An interesting story about the rediscovery of the Blue Serpent Clock Egg and how it came to be exhibited in Londen can be read here. 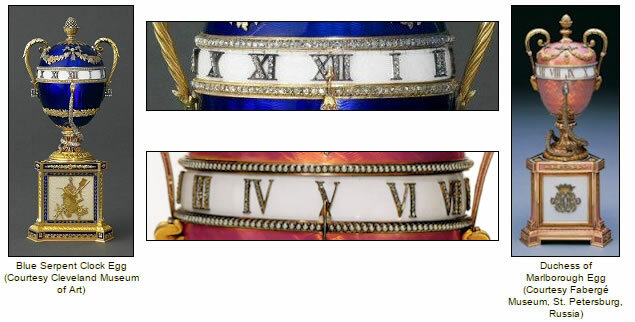 An archival Wartski photograph of the Blue Serpent Egg (left below) compared to a recent illustration (right below) in Artistic Luxury: Fabergé, Tiffany, Lalique (2008, 65) shows two different front panels under the stationary snake indicating the hour, suggesting a rotation of the base has taken place. (Source: Fabergé Research Newsletter, Spring 2009). This Egg is very similar to the "Duchess of Marlborough Egg" (ca. 1902). For a story in the Fabergé Research Newsletter, edition Fall 2013, some predecessors were found that could well have been a source of inspiration to Fabergé!